Roots of some cacti become enlarged and succulent, but by a mechanism completely different from that in shoots. Shoot succulence in cacti is always based on primary tissues, always at least cortex, sometimes pith as well. But Matt Stone-Palmquist found that in cacti with enlarged, succulent roots, it is always secondary tissues – specifically secondary xylem (wood) – that becomes enlarged. As in most dicots, the cortex of cactus roots is shed very early, while the roots are still very narrow; as a result, one of the interior tissues, probably the endodermis but perhaps the pericycle, becomes the effective root surface. 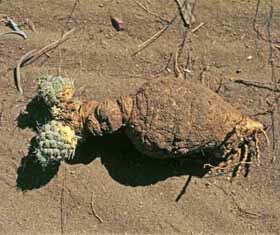 Whichever tissue it is, it immediately begins to act as a cork cambium and produces a bark even while the root is young. Simultaneously, a vascular cambium develops between xylem and phloem and begins adding conducting tissues to the root. In cacti with ordinary, non-succulent roots, the root wood usually has a matrix of xylem fibers even if the shoot has WBT wood or parenchymatous wood. The root vascular cambium produces wood rather slowly such that even old roots remain rather narrow and tough. But in the species with enlarged succulent roots, the vascular cambium produces copious amounts of wood, each year producing much more than is produced in the stem of the same plant. This rapid growth is possible because the wood has large amounts of relatively inexpensive cells such as parenchyma or WBTs. Very often the rays are extremely wide, but the axial tissues derived from the fusiform initials also have abundant parenchyma in addition to vessels and a few fibers. Only a few species of cacti have succulent roots, which is surprising considering the advantages that these provide relative to succulent stems. By storing water within roots, the water is in a microhabitat that is cooler and more moist than that which surrounds the stem, and succulent roots are more well-hidden from thirsty animals. However, succulent roots are found only in cacti with rather small stems; such small stems can benefit from the water stored in rather small roots, the type that can grow in rocky soil. For succulent roots to be of much benefit to giant columnar cacti, the roots would have to be large, so large that it is unlikely they could possibly develop in the rocky soil needed to provide stability for a large shoot. 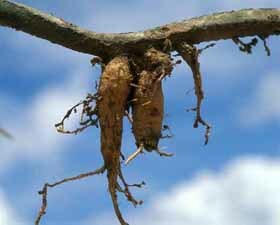 Truly giant roots could develop only in sandy soils, but such soils are not strong enough to stabilize big plants. Old plants of Pterocactus araucanus are mostly root with just small amounts of stem. Click on any photo for a larger image. Even adventitious roots of Monvillea spegazzinii become succulent. This peyote (Lophophora williamsii) has a growth form common to many small cacti -- a taproot that merges uniformly with an underground shoot that terminates in a small bit of aerial shoot. The storage function of enlarged roots of cacti certainly involves starch, because most root parenchyma cells have high concentrations of starch grains. It would appear that the roots also store water for the plant as well because the root cells are not usually packed with starch grains so there is plenty of room for water. 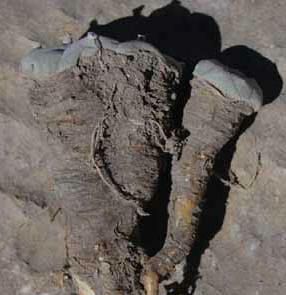 In species with succulent roots, the roots have wood-based succulence whereas the shoots have cortex-based succulence, and wood in the shoots basically just conducts water whereas that in the roots not only conducts water but also stores water and starch: wood in the two different organs has distinct functions within a particular plant, and not surprisingly Matt Stone-Palmquist found that the two woods almost always have distinct anatomy.